It’s not like I didn’t warn everyone. Last summer I wrote a column on the illegal rollouts of dockless electric scooters by Bird Rides in Cambridge and Somerville that was extremely critical of the company’s move on two grounds: safety, and the problem of governments focusing on private transit options instead of improving public ones. While the sketchy conveyances were prohibited temporarily in a number of area communities—including Boston—thanks to a lack of proper state regulation, the scooter industry is putting a full court press on area politicians to help them open the much-coveted local market. And it’s definitely working. Starting with Brookline’s seven-month pilot program allowing rival electric scooter pushers Bird and Lime to each deploy 100 of their infernal machines on public thoroughfares. So, it’s clearly time to double down on my first critique and expand the second. Yes, unbelievably, a 62-year-old woman was injured 15 minutes after getting on a Lime scooter and had to be hospitalized, according to WBUR. At what was supposed to be a carefully staged press junket aimed at sidestepping public safety concerns. Oh, and the Bird launch director led a scooter “safety” training session without wearing a helmet. That last snafu was particularly ironic. 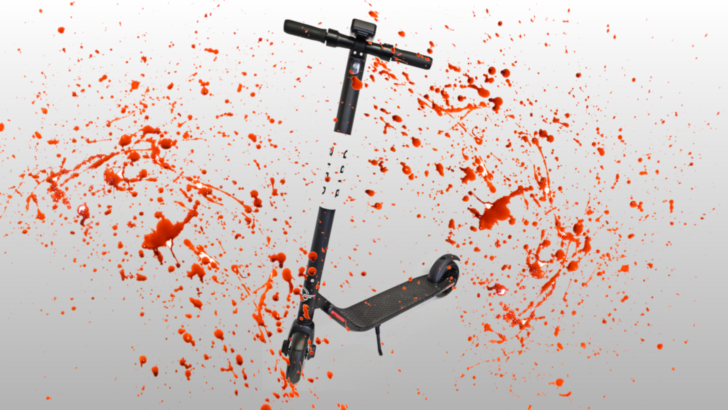 Bird corporate certainly didn’t show much concern about safety last year when it dumped scooters on Camberville streets without saying a word to local or state government. Other than the declaration (matched by competitors) that users could send for a free helmet after signing up for the service on the company’s app. But Bird had no way to provide helmets at the point of sale. And besides, what difference do helmets make when the contrivance in question is, as I put it, “a motorized skateboard with handlebars”—that offers no protection of any kind to riders on busy city streets? Not to mention busy sidewalks. Observers in other cities that had the scooters pressed upon them earlier than Greater Boston did have pointed out that many users not only clutter sidewalks with the machines when they’re done using them, dropping them where they lay, but also drive on the pedestrian paths. Turning them into auxiliary roadways, and making foot traffic into the hapless targets of barely-trained human cannonballs. Also, Bird, Lime et al don’t include insurance for either riders or anyone/thing they might hit, and make users sign waivers absolving the companies from any responsibility for accidents. And there had already been accidents aplenty nationwide when I first wrote about electric scooters. Since that time there have been many more. That was just one hospital in one major city dealing with the sudden appearance of the weaponized children’s toys. The several companies entering the electric scooter business have now begun talking about safety in the margins of their marketing pitches, but it still seems like a distant second consideration to fattening their bottom lines. In February, Citylab reported on a Bay Area “Micromobility Conference” attended by the entire nascent industry for atypical personal transportation. Which relates to the second thing I previously criticized about Bird’s antics (and about the electric scooter industry in general): it’s another form of privatized transit at a time when we need to defend and expand our public transportation systems. A couple of issues to unpack there. 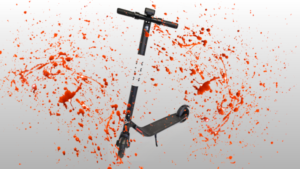 To continue the insurance discussion, Bird and the other e-scooter entrants are passing all the risks of their fundamentally anti-social product onto the public. Both in terms of causing the injury of users and bystanders alike, and forcing them all to personally pick up the health and liability costs of accidents. And in terms of harming governments by handing them a variety of new messes to clean up after. From increased emergency service calls following the growing number of smash-ups to public works costs for appropriate signage and specialized traffic lanes where possible to sanitation costs. Sure, cities are starting to charge companies like Bird and Lime various administrative fees and forcing them to add surcharges to each ride in their municipalities. In Brookline’s case, a single $1,000 license fee is being required during the pilot period plus $1 on top of the initial $1 the companies charge to start each ride, according to MassLive. But Bird has already griped about the Brookline fees. And according to the Raleigh News & Observer, both Bird and Lime just announced that they were leaving Raleigh, NC when that city charged them an impressive $300 fee for each scooter the companies deployed within its borders. So the industry leaders’ current game plan is clearly to try to ensconce themselves in new markets with promises to be good corporate citizens, and then shake off any such public fees—threatening to leave if their deregulatory demands aren’t met. The other privatization issue raised by the role of this so-called “micromobility movement” is the biggest question of all: Why are Massachusetts cities and towns screwing around with figuring out how to help Silicon Valley jerktech purveyors get rich by suckering hipsters into using dangerous unprotected motorized vehicles capable of doing 15 mph on already-packed streets that often started as the narrow meandering cowpaths 400 years ago? When what we desperately need politicians to focus on is fixing our existing public transit systems statewide. The problems of the Bay State’s largest public transportation network, the MBTA, are already much discussed—in this column as much as anywhere else—but, as I’ve written before, there are 15 other regional transit authorities (RTAs) in Massachusetts. And most of them are in truly dire straits. Completely starved for funds by state government, and deficit spending to try to survive year to year. As the Daily Hampshire Gazette reported this past weekend, the Pioneer Valley Transit Authority (PVTA)—a system that covers over 24 member communities—serves more than 600,000 people every year. But it was basically level-funded in this current state budget, and hasn’t seen a genuine increase in funding in years. Which has meant serious, ongoing, and accelerating budget cuts. Yet many of its users are the poorest of the poor in rural areas with few jobs and fewer public services. Among them are many elderly people who can easily find themselves completely isolated without regular assisted transit options. Given the magnitude of the crisis faced by the MBTA and the RTAs, and the massive environmental and political crises created by continuing government support for that worst and most irrational of all transportation modalities, the personal carbon-burning automobile, I fail to understand why local governments and the State House (which has a bill from Gov. Charlie Baker and several bills from legislators aimed at making it easier for e-scooters to legally operate in the Commonwealth) are wasting time courting a new for-profit transportation industry that drapes itself in the cloth of environmentalism (because its two-wheeled terminators are “green”) but cares not a whit for the serious public policy problems it is creating. Or the desperate transportation crisis it’s making worse by diverting attention and resources into its venture capitalist-backed maw. The best way out of this situation is to initiate very democratic and very public planning processes to redesign our municipalities for a future with a vastly expanded multi-modal and above-all safe public transportation system. A future without cars, it must be said. And then enjoin government at all levels to fund the resulting initiatives properly. As with most policy responses I call for, this is a tall order. But it is also what we need. What we don’t need are rent-seeking private transit initiatives that socialize unnecessary risks and privatize profits. Like electric scooters. A bad bet for cities and towns, and certainly riders and pedestrians, if ever there was one. This article was first published in DigBoston on 4/2/2019. It is being re-posted here with the express permission of that fine publication.